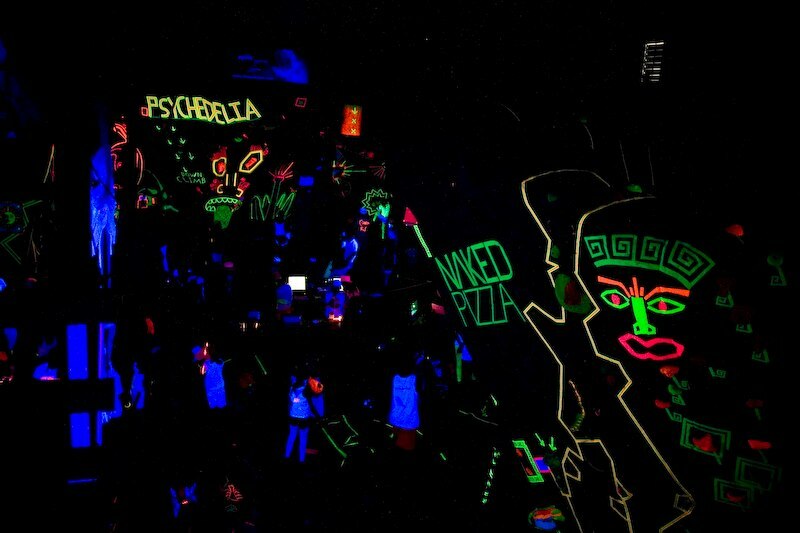 Home > 2012, 2013, Comps, Psychedelia	> Psychedelia Blacklight Costumes – What Glows and What Doesn’t? 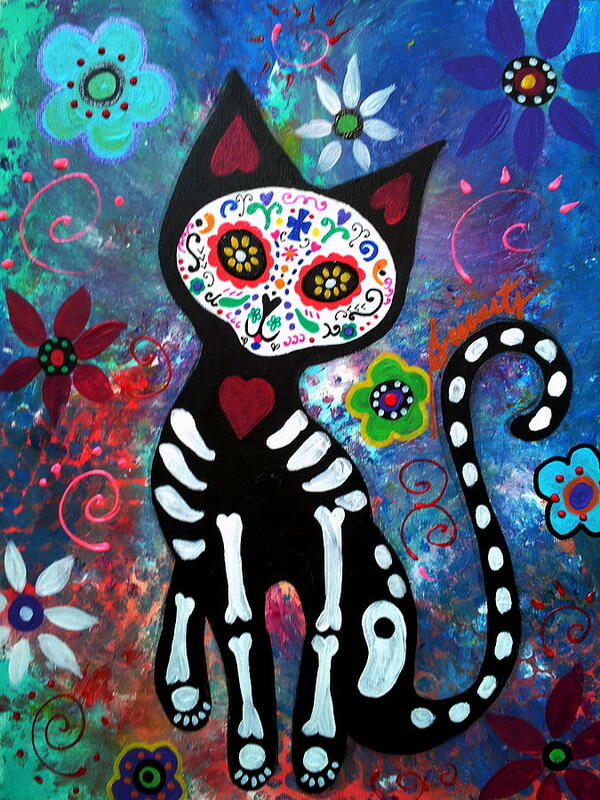 + 2013 Theme: Day of the Dead! 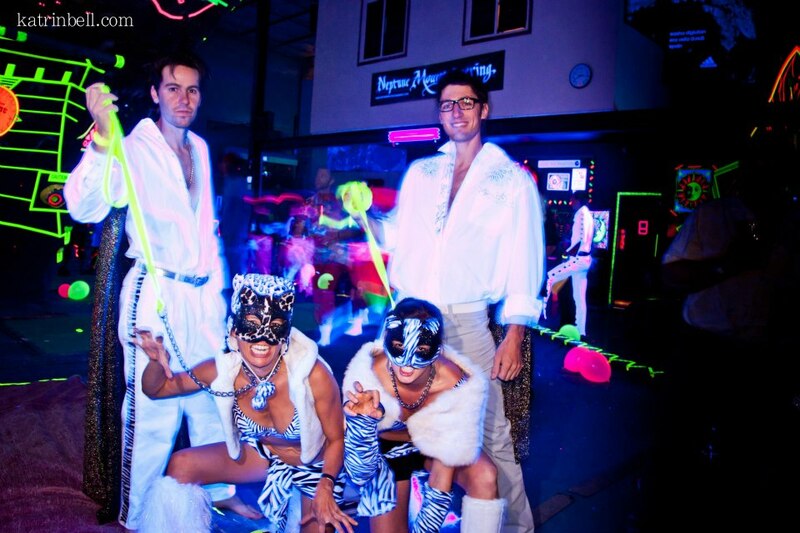 Psychedelia Blacklight Costumes – What Glows and What Doesn’t? 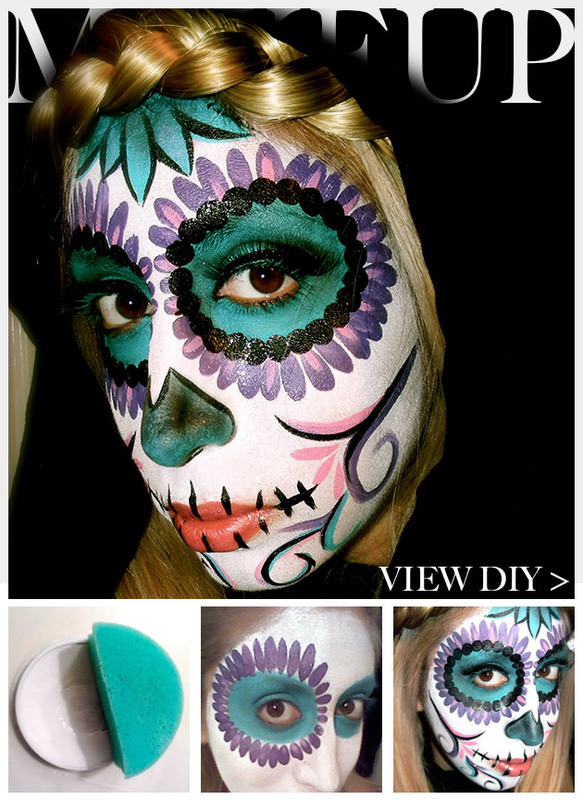 + 2013 Theme: Day of the Dead! 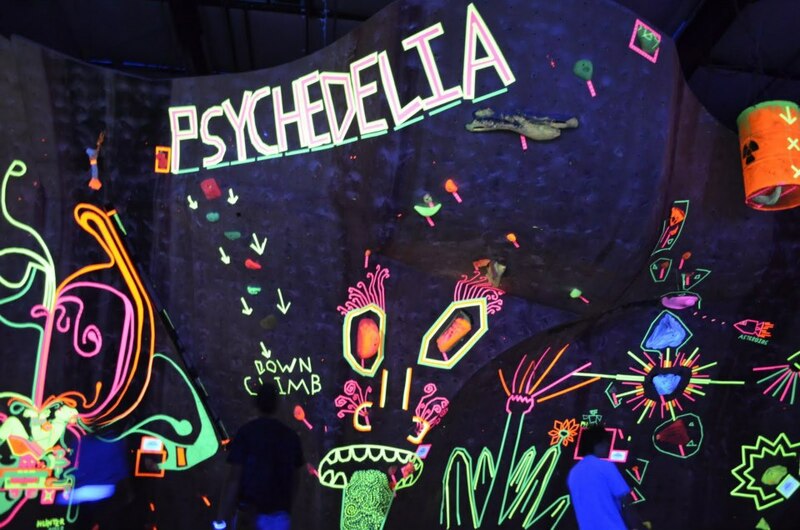 One of the biggest questions people have about Psychedelia is: “What should I wear?” With this post we hope to help you figure that out by sharing what we’ve learned over the years about black lights and reactive costumes and accessories. Below are some notes and products that we’ve found that work. When you are searching, learn to look for popping fluorescent (not just neon) and the “hyper-white” which is the nearly fluorescent looking white color you will see in some clothing, feathers, and other costume parts. This white will often glow like gangbusters, where other whites will look dull or not glow at all. 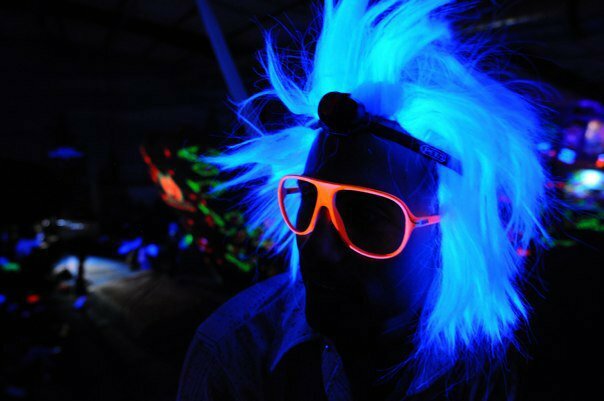 Many products will specify whether or not they are black light appropriate. Key words to look for are fluorescent and/or black light reactive and/or UV reactive. Successful whites from costume contest winners Siegfried and Roy and the white tigers, aka Matt and Sandy Wilder, Jon Glassberg and Paige Claassen. 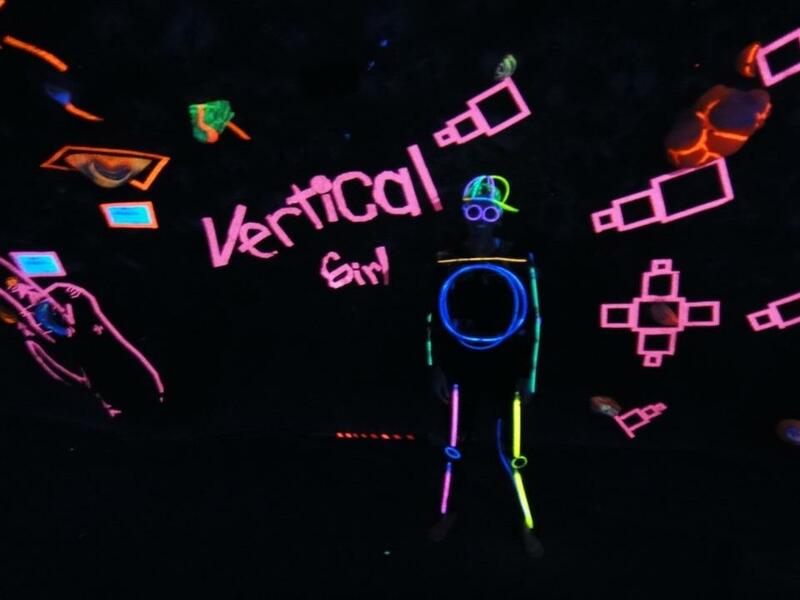 If there is any question for glow, a portable black light flashlight is the safest way to check, or you can bring your item down to The Spot in the weeks before Psychedelia and check it out in our black light boxes. 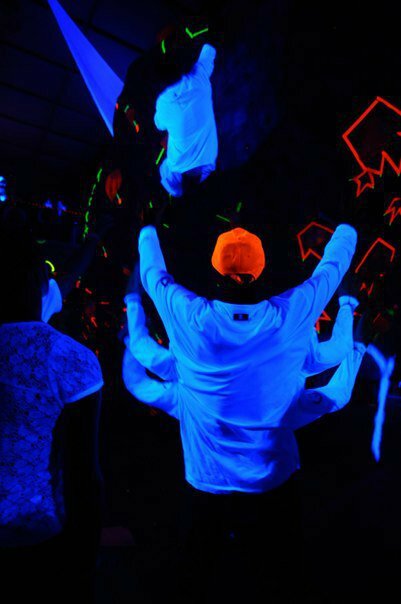 We use REAL black lights at The Spot, not just purple or UV lights, and anything claiming to react to real black light should shine like a champ. A little black light flashlight can be used for testing. Between $6 and $15 on Amazon or at McGuckins. White clothing can go either way. Anything with a lot of white threads will often glow. Once you learn to see it, you can often tell from looking at the thread whether or not it will pop. Screen-printed whites usually WON’T glow. White embroidery usually WILL glow. Cottons, especially 100% white or heathered cotton clothing, usually will glow. So will most spandex. Bleach and bleached items will glow. There are types of laundry detergent that will cause fabric to glow or to glow better. Glowing white cotton and lacy white shirts. Other colored fabrics will sometimes glow very well if they have a white cotton thread base. White thread t-shirt trim will often glow, so even if your shirt doesn’t glow your threads sometimes will. Fluorescent fabric depends on the fabric. Fluorescent yellow is usually the brightest. Fluorescent spandex will often glow really well. Yep, from Target. Glow like crazy. Cheap women’s fluorescent spandex undies from Target or similar stores will often look amazing and can be worn over tights for the short-shorts look. Fluorescent spandex full-body suits work very well. Fluorescent netting often looks like it should glow, but plastic-based usually won’t. Fabric/cotton based usually will. The netting on her skirt and wings glows quite well. 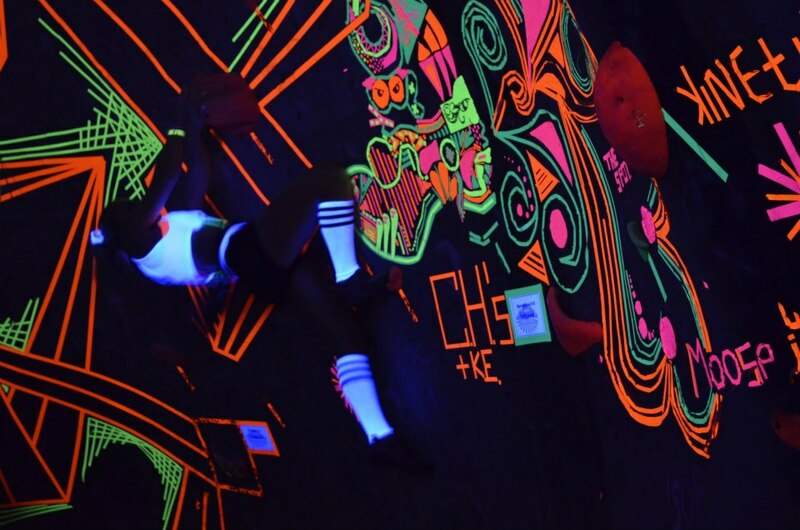 It is extremely hard to tell which fluorescent fabrics will and won’t glow without the black light test. You can get fluorescent thread to add detail to your costume. Available at Jo Anne’s and online. Glows really well. Wigs can go either way, depending on the base material. Many types of white and fluorescent feather and fur will glow well. 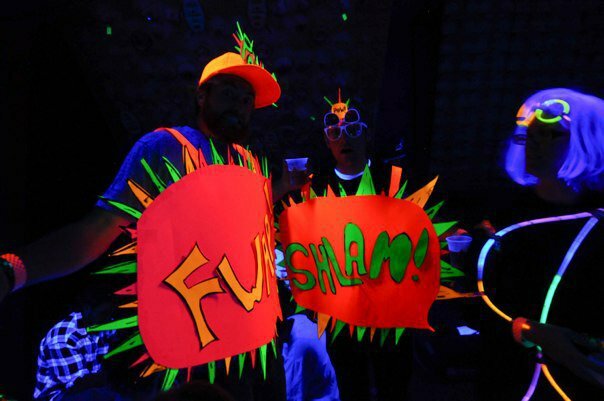 Fluorescent poster boards glow very well and offer lots of costume options as they are cheap and easy to draw on and cut and tape together. 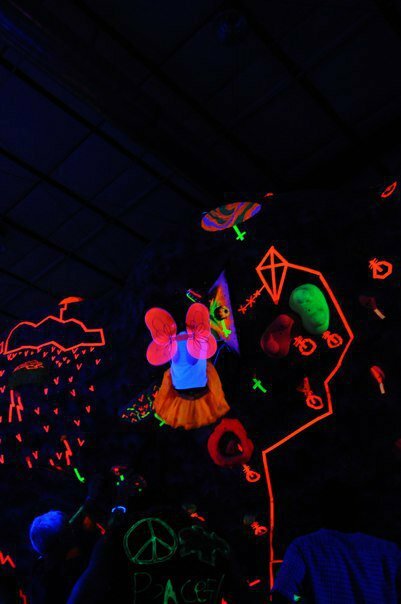 Cheap plastic fluorescent or black light reflective items will often glow very well and not break the bank. We haven’t tried these, but they look like they’d be amazing! Furry black light reactive booties. Come in orange and green. Not good for climbing, but great for costumes! These are cheap and glowed really well. Seemed to fit adult heads just fine unless you have a head bigger than size 7.5. Notice the brightly glowing accessories here. Creative uses for poster board. The year before these guys won the costume contest as a pair of giant highlighters. A jet pack. Very Creative. 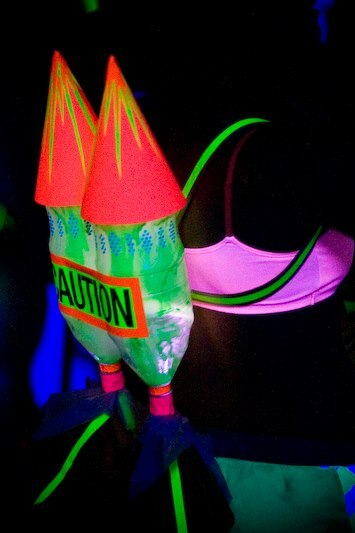 Spray paint and body paint will glow if they say fluorescent. Check out Casey’s radioactive man! Fluorescence in paint, tape, clothes, plastic, fabric, make-up, hair gel, hair spray, fake eyelashes, nail polish…pretty much anything with actual fluorescent added to it will look amazing. Use a blacklight to check! 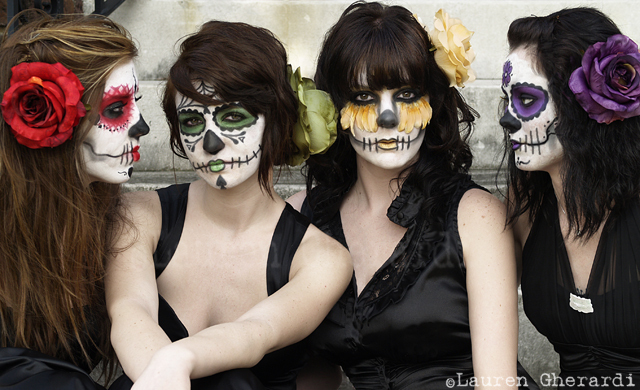 With body paint you can give the impression of floating bones, wings, or whatever else you want to paint on your body. Highlighters glow and can be used to decorate skin (not sure if it’s recommended, but it works). Laundry Detergent with any type of bleach or bleach substitute will usually glow and cause things painted or washed in it to glow. Glow sticks or jewelry of any type and small lights in reds, blues, greens, purples, pinks, and neon yellows are appropriate for Psychedelia. Clear or white lights are interruptive to your eyes at Psychedelia and so not appropriate. The little packages of glow sticks for $1 at Michael’s Art Stores don’t work very well, so are not recommended. Blacklight balloons glow fairly well. 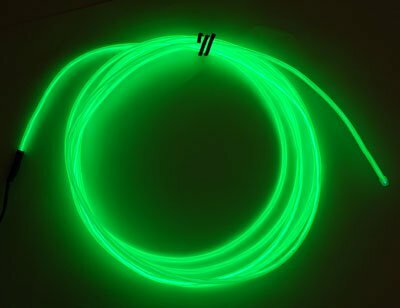 Popular for Burning Man, also awesome for Psychedelia and other black light events, electroluminescent wire is a thin, flexible string that glows like nobody’s business. 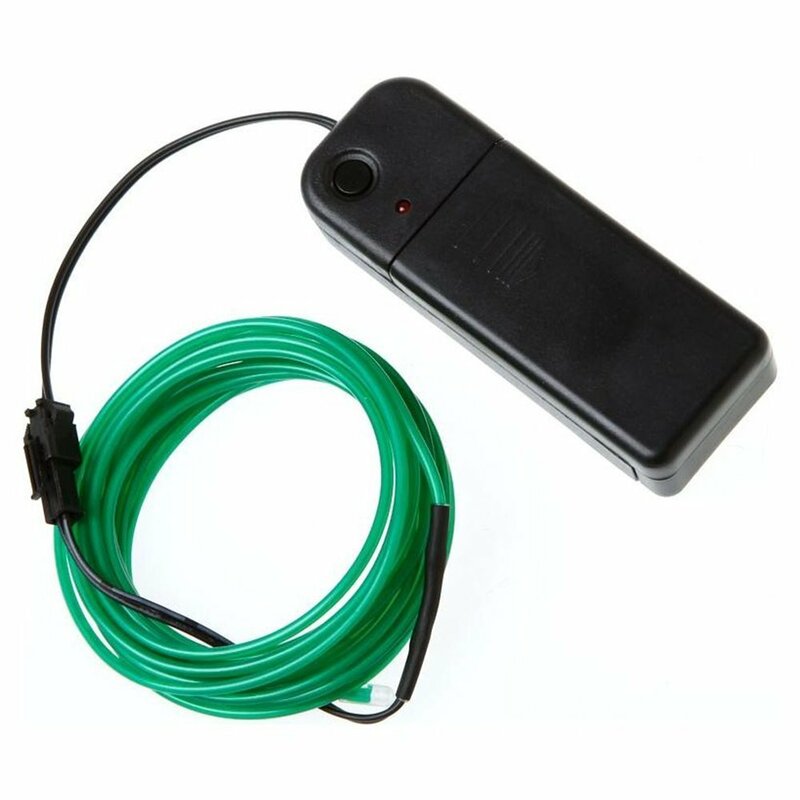 The power pack is small and light so you can stick it to your body or clothing without too much disruption, then use the wire to make your costume fantastic! The power pack is pretty small, and the ones they have at McGuckin can run several El Wires off one pack. Available at McGuckin’s or online in various colors. McGuckin also has some light up flat strips that are pretty cool. Glow-in-the-dark items do not usually “pop” so they are not so good for Psychedelia. 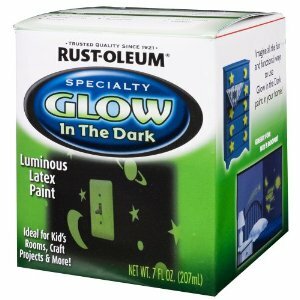 Known exceptions – glow in the dark spray paint (Krylon), glow in the dark chalk, glow stars and planets. 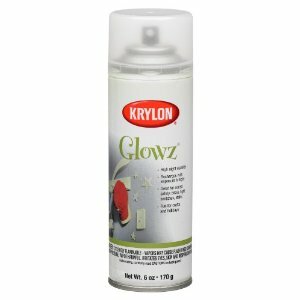 We used this glow spray paint to paint the knobs in the Dojo and it worked great. 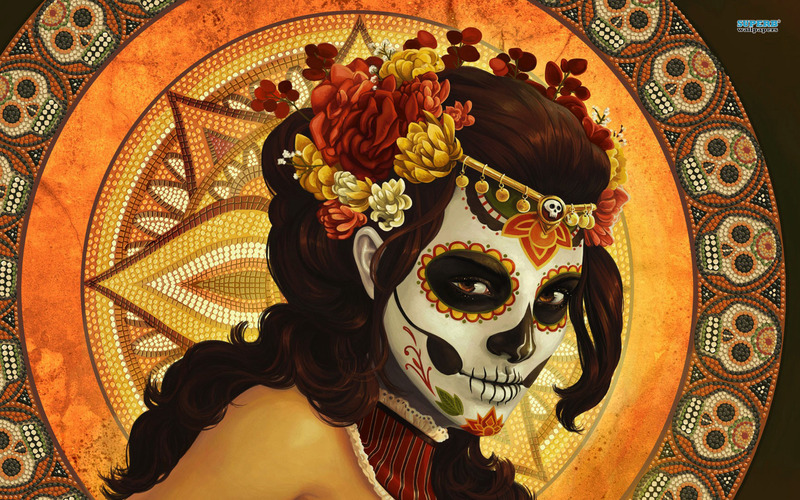 Probably not good to put on your skin, but it can be great for making costumes. They have it at McGuckin. 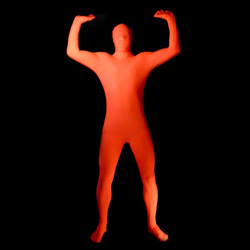 This glow paint also works well (not for your body) and is available at McGuckin. Gaffer’s tape is a cotton cloth based tape that is normally used in stage and production work. The gaffer is the head of the lighting department on a film crew, and the lighting department uses this kind of tape to hang things and tape wires, cords, and cables. The tape is very strong and removes cleanly, unlike duct tape which often leaves residue. Some gyms use gaffer’s tape all the time, but we prefer regular duct tape for most of the year. For one reason, gaffer’s tape is generally 3-4x more expensive than duct tape per roll. A 2″ wide roll of gaffer’s fluorescent can cost $20 or more. Because of the cotton-cloth base, many types of gaffer’s tape may offer some glow, but only the fluorescent colors (orange, pink, green, yellow) offer the real blacklight reactivity and “pop” we are looking for with Psychedelia. White doesn’t work as well as you might expect. We use over 50 rolls of 1″ gaffer’s tape in these four colors to tag the problems and decorate the gym each year. Some companies will offer these fluorescent bases with additional patterns–camo, triangles, hearts, stars and moons, celtic knots, and more–which give some variety; however, we usually turn each problem into its own work of art, so the specific color/pattern of the base tape is not that important at Psychedelia as long as it glows. Also important to note, some rolls of pink/orange and yellow/green will look the same in blacklight, but others will not. This is because sometimes a company will use, for example, orange fluorescence to make the orange rolls and the pink rolls glow. The colors look different in regular light, but in blacklight the color of fluorescence is what you see, so they will look the same. We’ve had the same company send us pinks that looked orange and pinks that looked pink, all in the same batch. You can check this roll by roll with a portable black light flashlight. Awesome. In the direct center of this picture is a hanging tire covered in fluorescent gaffer’s tape. It really glows! Gaffer’s tape rips more cleanly, easily, and evenly than duct tape. Because of this, gaffer’s is good to use for decoration as you can rip different widths of tape off the roll. You can also purchase rolls of varying width; local tape company Identi-tape has 1/4″, 1/2″, 1″, and 2″ options and can often do custom batches of bigger or smaller rolls with patterns on them. 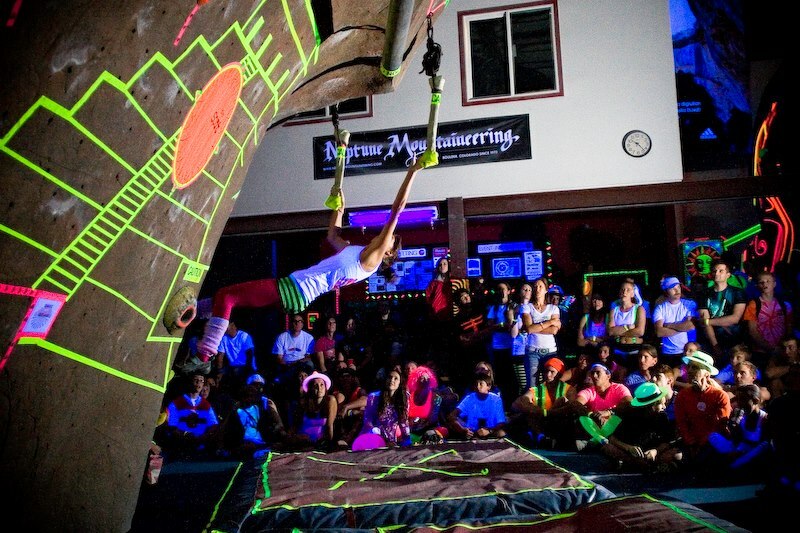 Perhaps you’ve seen the tape they made for E-Grips, The North Face, The Access Fund, or Atomik Holds. They also provided the 2″ Caution Cable tape we used for finals tape in 2012. Gaffer’s can make some great costume additions, as you can make things like suspenders and leashes out of it by taping two pieces together, or by taping it around existing fabric, plastic, or whatever else you’ve got going on. It won’t work well when the fabric stretches, as the stretch will break the adhesive and the tape will come off. 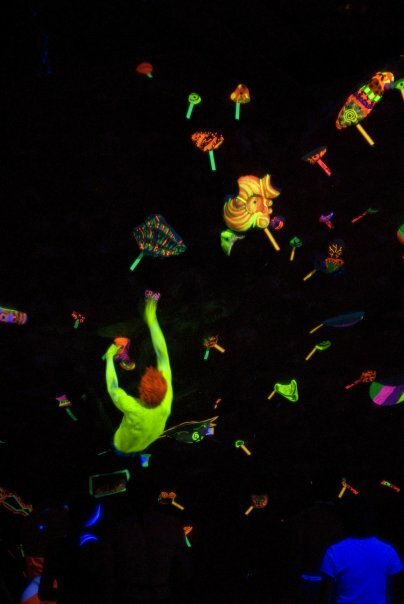 Only the fluorescents–pink, yellow, orange, green–will “pop” under the black light. “Glow in the Dark” tapes usually aren’t that great for Psychedelia, as they glow dully in the black light. It is fairly dark at Psychedelia and there are many people. Make sure your costume doesn’t drag on the ground and there aren’t lots of protruding parts to snag on holds or poke other people. Also, if you do paint your hands only paint the backs to avoid making the holds dirty or slippery. 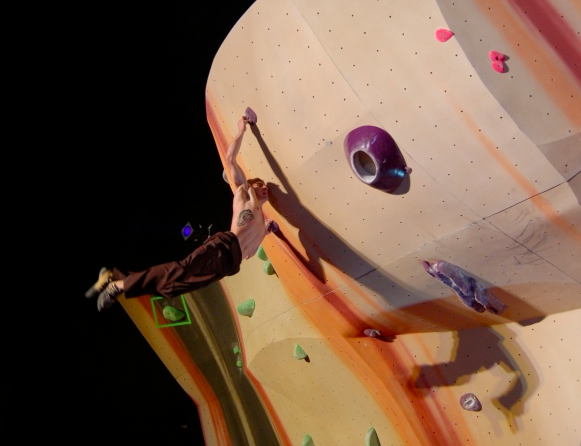 Click here to check out the Psychedelia 2012 Photo Gallery for more inspiration! 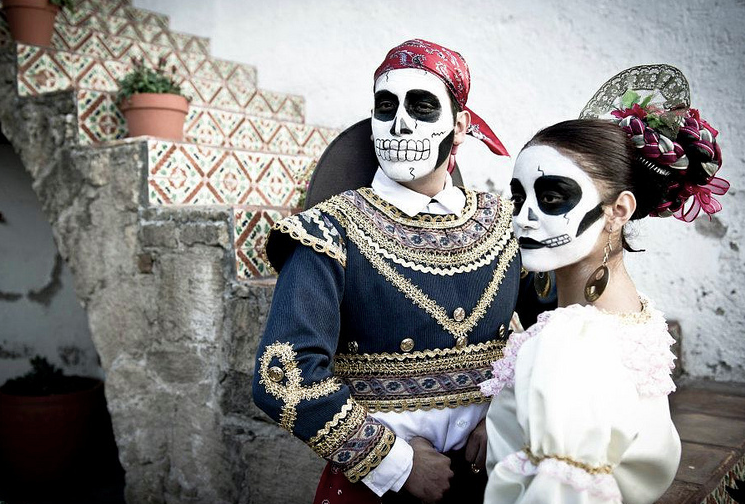 The Day of the Dead! 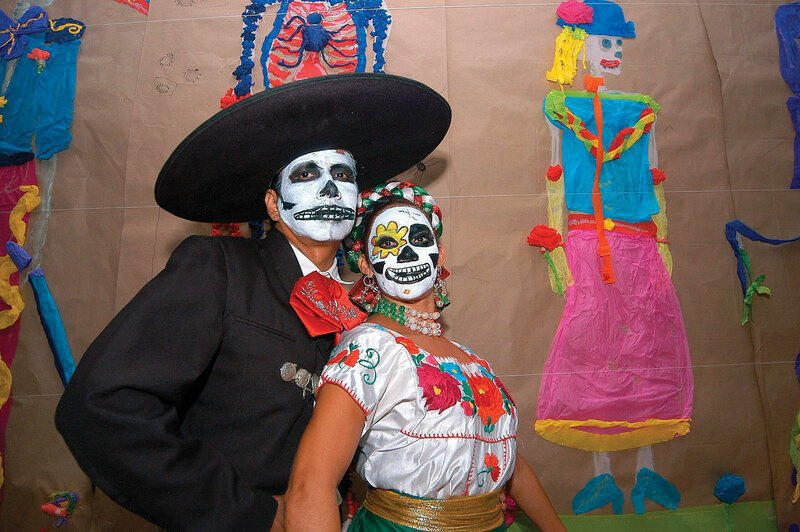 This theme gives you tons of room to be creative, as one of the main parts of the Day of the Dead costume is the white (make sure to get glowing white!) 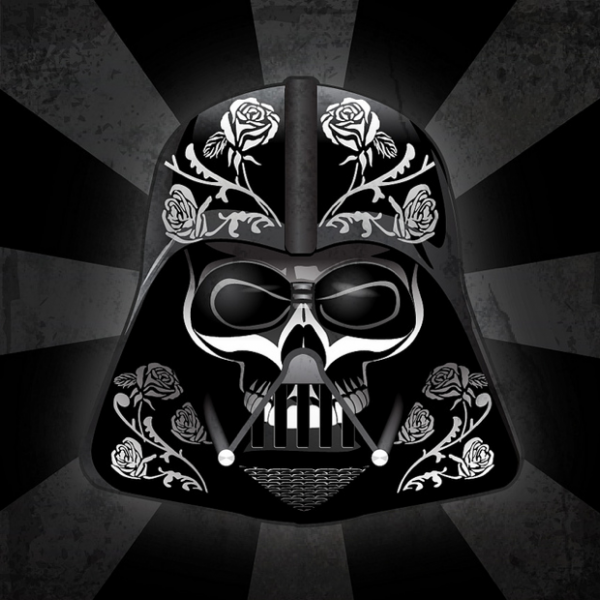 skull mask. Beyond that, anything goes! So there’s the theme, there are the tips, run with it! We’re excited to see what everyone comes up with!! !